Before taking up scuba diving as a recreational sport, it is important that you get yourself the necessary scuba equipment and gear. There are many options available but if you’re a beginner, it’s best to start from the basics such as the mask, fins, snorkel, and weight belt, then move on to advanced sets later. The diving mask allows you to see underwater through the glass plate in front. Most diving masks are constructed in such a way that a user can breathe out into the mask. This prevents the “squeeze” during the descent caused by pressure. Choose a mask that properly fits your face and forms a seal. Most scuba diving masks come with a rubber or silicone "skirt" that creates a watertight seal with the diver's face. There are several types of diving masks such as full face diving masks that allow underwater verbal communication, diving helmets using surface supplied diving equipment etc. Prescription masks are also available for people who wear prescription glasses. The Fins allow you to move freely underwater and should perfectly fit the feet. It should neither be too tight nor too loose which can hamper swimming capabilities, be very uncomfortable and even dangerous while taking a dive. The snorkel lets you breathe at the surface without raising your head from the water, and should be no lesser than 30 cms in length. The weight belt helps you maintain buoyancy so you should consider getting one if you’re a beginner. Diving suits like Wetsuits and Drysuits provide thermal insulation and prevent complications such as hypothermia. Remember that water conducts heat 25 times faster than air from the body. So, choose a suit depending on how warm or cold your diving water is going to be. There are two main types of scuba sets – open-circuit and closed-circuit. Most scuba divers use standard air - 21% Oxygen, 79% Nitrogen – for their open-circuit scuba sets, which is much more cost-effective than using mixtures such as heliox and trimix. The open-circuit scuba set (also known as Aqualung) itself is quite simple so is also cheaper and more popular than other types. Basically, the user breathes in from the set and out to waste, with the gas cylinder worn on the back. 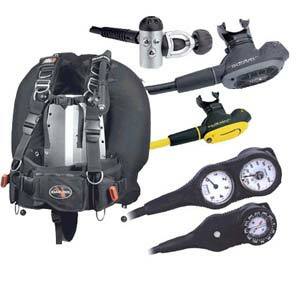 There are 2- and 3 backpack cylinders open-circuit scuba sets available. Closed-circuit scuba sets use rebreathers. In this system, exhaled air is reprocessed by the rebreather to make it fit for re-inhalation. This can be very economical for people who need to take long dives. The three types of rebreathers include oxygen, semi-closed circuit and fully-closed circuit rebreathers. Regulator and Buoyancy Compensator (BC) – The regulator, which carries the air from your cylinder, should be equipped with a gauge and second mouthpiece. The Buoyancy Compensator, such as such as a back-mounted wing or stabilizer jacket, is crucial for neutral buoyancy to control depth. Dive watch: Electronics like a dive watch comes in quite handy when measuring your time and depth underwater. A dive computer is also available for the same purpose which is more accurate but more expensive. If you plan to really move head with your scuba diving adventure, consider getting other useful accessories such as underwater light, a surface marker-buoy (SMB), a knife, and a compass etc. Experienced divers, Scuba Dive centers, websites, magazines, etc will all be able to assist you when searching for the right scuba diving equipment and accessories.